"Return to Titan," by Stephen Baxter, is set in the Xeelee universe. Michael Poole and his father search one of Saturn's moons for sentient life that would interfere with their plans to build a gateway to the stars. In this year's Theodore Sturgeon Memorial Award winner for best short fiction, "The Sultan of the Clouds," by Geoffrey A. Landis, a terraforming expert is inexplicably invited to Venus by the child who owns most of the planet's habitable floating cities. "Seven Cities of Gold," by David Mole, tells the story of a Japanese relief worker charges with tracking down the renegade Christian leader responsible for fetonating a nuclear device in an Islam-occupied North American city. In Jackie's-Boy," by Steven Popkes, an orphaned child befriends an uplifted elephant from the abandoned St. Louis Zoo as they trek south across a sparsely populated North America to find sanctuary. "A History of Terraforming," by Robert Reed, involves a young boy's ambition to take up his father's work of terraforming Mars and then much of the solar system and discovers that much more than planets have been altered. "Several Items of Interest," by Rick Wilber, the Earth ruling aliens enlist a human collaborator to help quell a human rebellion led by the collaborator's brother. Great collection of stories here - I really enjoyed discovering new authors as well as enjoying some from ones I knew. Their is a total of seven stories. I could give four stars to five of them, 2 stars to one and zero stars to one. It is unusual to have this many four star stories in such a collection, but it is also unusual to not have at least one excellent story. I bought this mostly for Robert Reed, who is the best short story writer in Science Fiction, ever. That includes Asimov and Clarke, who both I love. His story was not the best though, it was good, but I liked Jackie's Boy by Steven Popkes better. Baxter, Landis, and Reynolds also had good stories. If you are fans of these authors, then you may want this for these stories. I looked up Kaster on the internet, it seems he is a fan, who has never written anything himself. These stories seem to have all been written in 2010. My guess is Kaster only gets to buy stories after Dozois, Horton, Adams and everyone else in the business have bought their stories. Dozois is by far the best. Audible should see if they can record his yearly anthology. 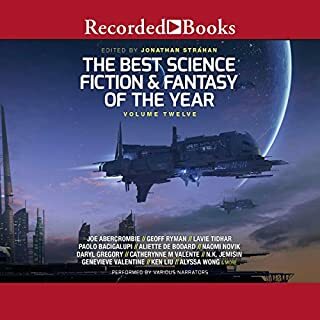 Did you know that even though this is titled The Year's Top Short SF Novels, you will not find it or most of the other SF anthologies in the category of Science Fiction/Fantasy Short Stories and Anthologies. While all other books can be found in three different cats, these have only made it to two. I e-mailed audible about this months ago, but I never heard back from them. 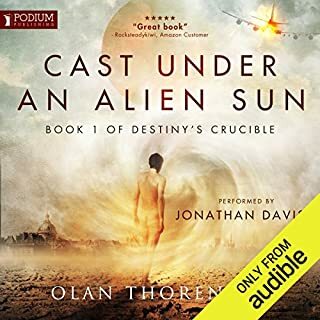 Where does The Year's Top Short SF Novels rank among all the audiobooks you’ve listened to so far? 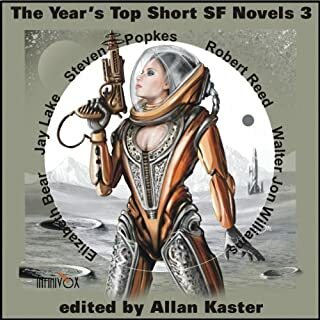 review of the publishers summary..
Would you listen to The Year's Top Short SF Novels again? Why? Rick Wilbers story is awesome. Spelling error in the publishers summary. You can delete this review once corrected. 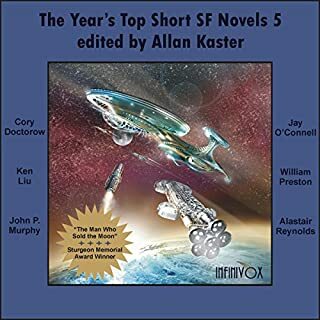 I have several of the books in these "Year's Top Short SF Novels" series. Like all such books, you get some you will like, some you won't - a mixed bag. There are usually a few gems in all cases that make it worth it. The narration is always by the same folks, and is competent, for the most part. I find the cover art bizarre. As though everyone reading is some teen boy and has to be titillated with "hot girl" pics that have ZERO to do with the content of the books. Sad. A little pathetic really. Particularly as some talented, established, award winning and serious SF writers contribute to these. It's surprising, as I think they'd be off-put by having their work represented in such a silly way. Anyway, on the whole, this book has a few really well done stories, some adequate, some I wonder about. But it's worth it, I think, if you enjoy science fiction and short stories. Stories were well written but depressing. A series of post-apocolyptical nightmares. Interesting ideas, good Science Fiction, very dark. I was really pleased to listen to this audiobook.... 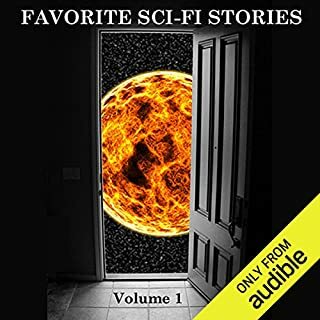 It was my first collection I had ever bought on audible and so didn't know what to expect in terms of quality or content. Well the content was amazing - every story was well narrated and kept me on the edge of my seat. The order of stories gives you a good range of topics and means you never get bored. Anyone who is looking for a great value, bite size stories that are perfect for a drive - get this! Bought for "Sultan of the Clouds", which was unfortunately quite disappointing. though can't say for sure if a more compelling narrator might have changed that. If you prefer hard scifi over soft, I'd suggest getting this collection in print if anything.